The last single from the masters of the morose, 'What is a man', raised hopes that the new album might present something somewhat different. That single was more upbeat, very sixties influenced, and showed a side to Stuart Staples' singing that has rarely been showcased. Alas, it was not to be, "can our love�" is business as normal for the tindersticks and, as such, is unlikely to set the world alight. "This dying slowly, it seemed better than shooting myself" (Dying Slowly). I've always been somewhat suspicious of tindersticks, never thought them to be as good as everyone else did. Mr Staples voice is great, yes, but their first two albums are so long, and he has such a limited range, that it was easy to get tired of it. Musically, they've never been innovative, borrowing bits and pieces from the Scott Walkers and, in particular, John Cales, of this world. This album confirms my suspicions. They do what they do adequately, but there's very little they can actually do. This even contains another bleedin' spoken word track, a la 'Tiny Tears', something they've never done as well as John Cale. 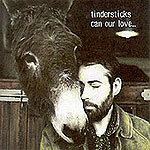 This CD is fine if you like what the tindersticks do. It's perfect music to put on low, turn down the lights and� slit you wrists to. It might even work for a romantic night in as well! And maybe it's a bit unfair to expect the band to do something other than what they do, but some kind of imagination would have been nice.